Home > Media > News > End the air rifle terror on orangutans! End the air rifle terror on orangutans! The misuse of air guns for hunting has become increasingly uncontrollable. Based on data from COP and other NGOs working in orangutan conservation, at least 40 orangutans have been recorded as victims in Borneo and Sumatra. The recent discovery that has seized international attention is about an orangutan killed with 130 shots in the Kutai National Park in East Kalimantan. In Sumatran Orangutan Conservation Programme (SOCP)​, so far we already found 15 orangutans had been shot with more than 400 bullets. Most of them were dead, some are still in the Quarantine Center, like Deka and Tengku. There are also who still alive but unreleasable, like Leuser and Lewis, due to a permanent blind in both of their eyes. 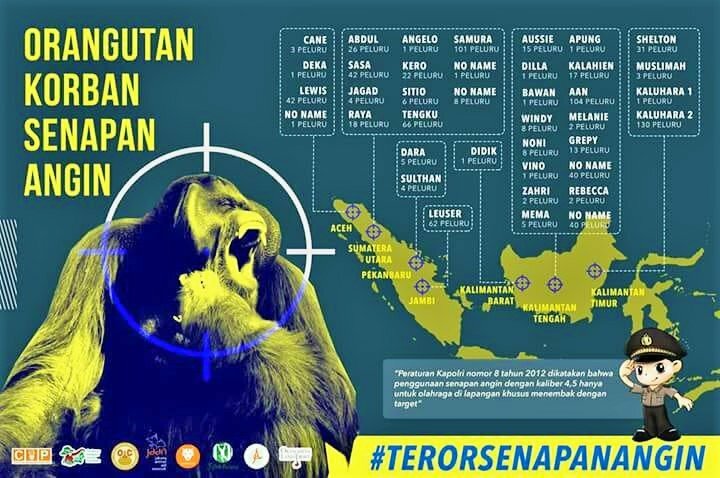 Leuser was found with 62 shots while Lewis got 42 shots. Now these big male Sumatran orangutan wait for a better life in the Orangutan Haven. The newest one is Dilan, that just recived at Quarantine center last week (15/2). Dilan was resqued from a village in South Aceh, without his mother beside him. He is also looks stressful and malnourished. From the first medical check, the x-ray test showed there’s a bullet in his body. Orangutans are a protected species in Indonesia, but deforestation has dramatically reduced their habitat and brought them into contact with farmers and plantation workers who kill them to protect their crops. Meanwhile, ownership of guns, including air rifles, is actually regulated in National Police Chief Regulation No. 8/2012, which stipulates that anyone wanting to buy a gun must obtain a permit from the National Police. But due to weak controls, abuse continues to cause victims to continue falling, including rare and protected wildlife in conservation areas.